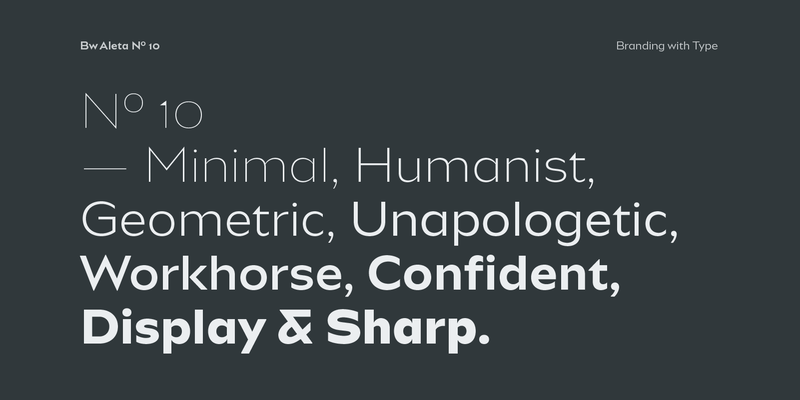 Designed by Alberto Romanos, Bw Aleta is a multi-purpose geometric font family with humanist traits. Its wide proportions, straight-forward drawing and generous modulation on selected areas, all build towards a contemporary & sharp personality. 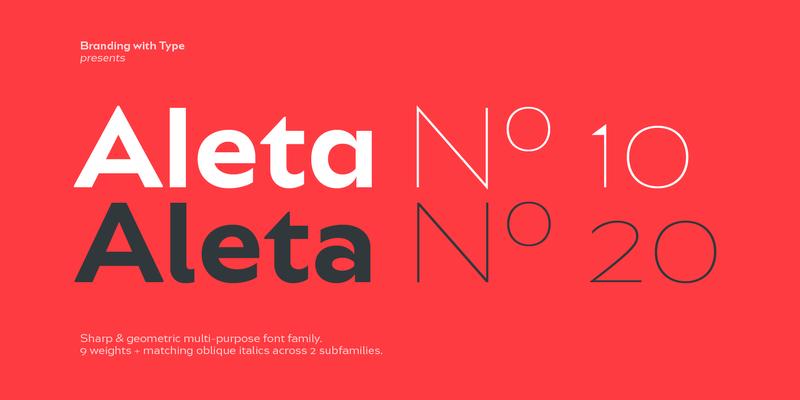 Bw Aleta font family is deployed as two distinct subfamilies: No. 10 is the quirkier sibling celebrating all its angles, while No. 20 presents a slightly quieter feel. Each subfamily consists of 18 styles (9 uprights + 9 matching obliques) supporting all European Latin languages. Common to both subfamilies is the almost perfectly circular letter “o”, both in upper and lowercase, informing the wide proportions of the typeface. Bw Aleta also features stroke modulation only when it matters, contributing to a minimal and contemporary feel while avoiding neutrality. The result is a highly functional font family with bags of character, well suited for branding, advertising or editorial projects. You could argue Bw Aleta No. 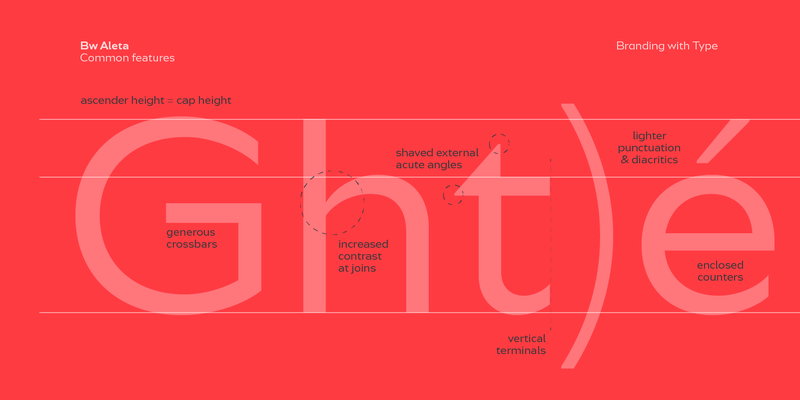 10 would be more suited for display purposes where it shows off all its quirky details, and this is true for the lightest weights with the triangular fins standing out in contrast with the thin stems, but it’s equally confortable at small sizes over long paragraphs. Bw Aleta No. 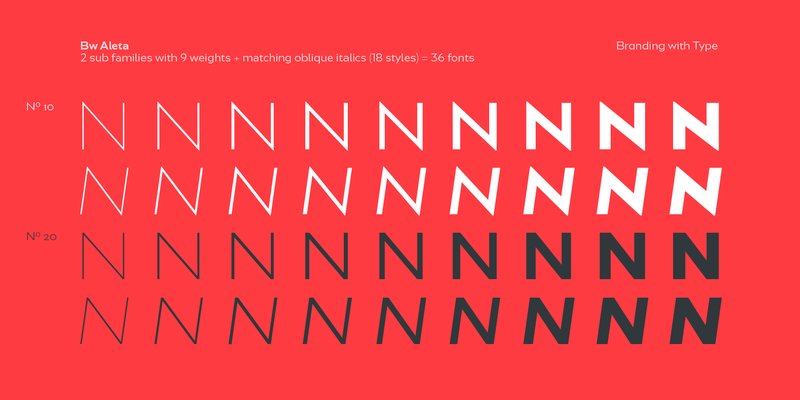 20 takes a small step back and presents certain modifications in order to increase its legibility, conveying a slightly more traditional feel without loosing its character. 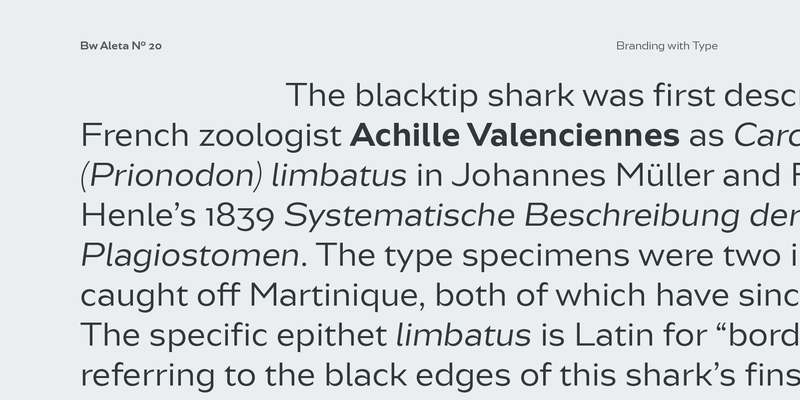 As well as the obvious double storey “a” and the tail on the lowercase “l”, all the blunted apices on the triangular shapes create a better balance between fills and counters, helping conforming a more homogeneous texture when setting paragraphs. 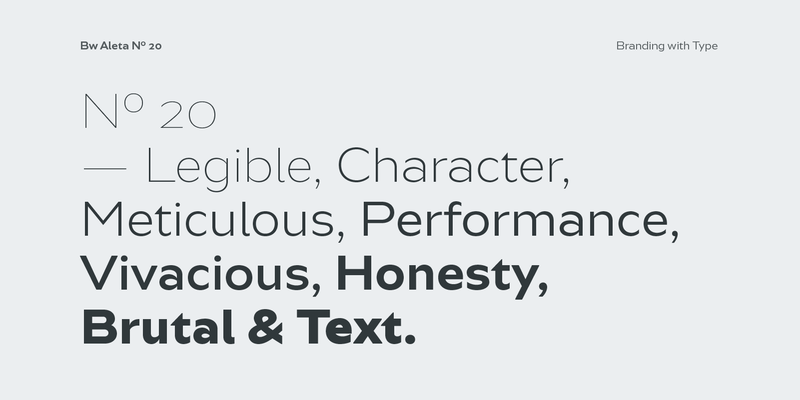 Among the OpenType features included on the Bw Aleta font family you could find Old Style figures, fractions, case sensitive and localised forms. All our font families can be licensed under any our our standard Desktop, webfont, desktop + webfont and the exclusive Branding with Type all-in-one licenses. Click here for more images of Bw Aleta and all its licensing options.